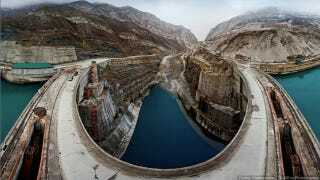 Can Someone Put This Dam in a Video Game? Please? Video games have the ability to take us, well, anywhere. We can visit other planets, we can visit destinations far away, and we can even travel back in time. I'd like to go here. Here is the Irganai Dam in Dagestan, Russia—the largest derivational hydroelectric power station in the country. Construction on the plant began in 1977, and the station became operational by the mid-1980s. The surrounding environment is stunning—and the dam is outfitted with tunnels and cranes and surrounded by icy water.